Choosing the right gift for someone you find special can be pretty tough. If that special someone is a musician, there’s a bunch of stuff you can get them, especially when talking about drummers. However, what gift can you get for a drummer, that they are going to find useful, but isn’t too expensive? In order to avoid incompatibility with the rest of their gear, the best possible solution is to go for something that’s guaranteed to work no matter their setup. On the other hand, if you’re familiar with their kit, or maybe even know what they would want or need to upgrade their setup, go for it! Just make sure you’ve got all the model names and specs 100% correct. Metronomes are always a great idea because every drummer should use one, regardless of their skill level. There are great options to choose from when talking about classic metronomes, but there are also cool new vibrating ones, which can come in as handy if the drummer is already using in-ear monitors. Practice pads, both the classic ones and the ones that offer a built-in metronome and counting/speed modes are perfect for drummers that don’t have a place where they can practice every day. Tools, bags, monitors, and other similar gadgets and accessories may sound as a bad idea at first, but trust me, it’s the little things that you find yourself using all the time that turn out to be most useful. So, let’s cut the chase, and get right to our pick of the 20 best gifts for drummers you can get! The DB-90 is much more than a simple metronome. It offers amazingly useful features such as an onboard rhythm coach to help you progress more easily when practicing, programmable beats for custom sessions, as well as sample- based presets which sound just like real drums. You can even plug in a guitar, bass, or a mic, making it perfect for jamming with a band while making sure you don’t miss a single beat. Whether it’s solo practice or band sessions, the DB- 90 is probably the best metronome you can get. Straying from the traditional metronome format, the Soundbrenner Pulse stands as an innovative solution for drummers, as well as other musicians, when it comes to playing on beat and time. Pulse lets you focus more on listening other bandmates while giving you haptic feedback on your wrist. Offering vibration much more powerful than of a smartphone, the drummer won’t miss a beat no matter how energetic and wild his playing is. Apart from being a great gift for a drummer, the Soundbrenner Pulse is a great way of keeping the whole band playing synchronized, as you can connect multiple devices to a single source. Plain old rubber practice pads are a thing of the past. The 3 in 1 pad by Neewer keeps things simple but, at the same time, offers very useful features for drummers on the go, and those who just don’t have a practice space available at all times. The great thing about this pad is the small display which shows you either the number of strokes or the speed at which you’re playing. It even has a built-in metronome for added precision. 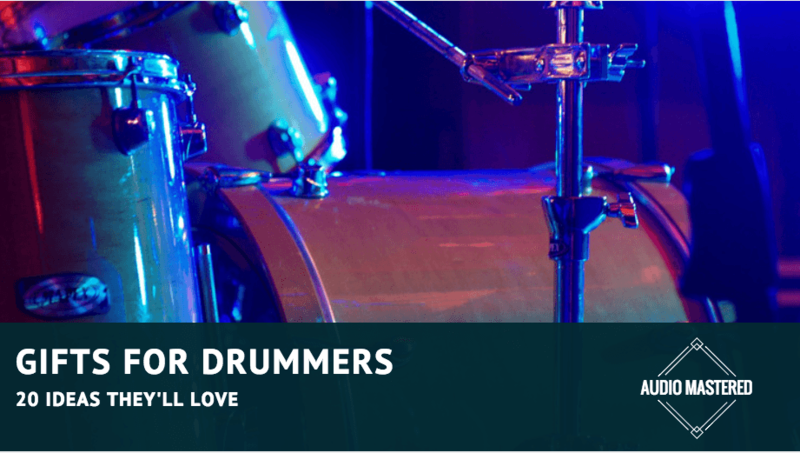 It’s perfect for every drummer, no matter their skill level, as it allows them to practice strokes, speed and tempo practically anywhere and anytime. Even though at first glance this kit may seem like a gimmick or a toy, it’s actually pretty good. Boasting a full set of 9 pads and 2 pedals, it’s super convenient and lightweight, and surprisingly it sounds more than decent. As it has its own speakers, you just need a power outlet and you’re ready for practice sessions. Look at it as a simplified version of an electronic drum kit. Moving on to actual drum accessories, the MCB22-BP cymbal bag by Meinl is a lightweight and sturdy bag, designed to protect cymbals in a practical and handy way. As it has padded shoulder straps, carrying around equipment should be less of a pain in the back. If that special drummer of yours is complaining about hauling all of that equipment all the time, get them this bag! Just make sure the size is right and you’re good to go. Even though drumsticks aren’t the heaviest component of a drum set, that doesn’t mean that you don’t need a bag for them. Whether it’s a matter of constantly breaking sticks and needing new ones, or simply wanting to have extra ones with you at all times, this bag makes for a very practical gift to get. The outside pocket can house various other things, such as tools or earplugs. Nowadays, a GoPro camera is a great gift for just about anyone, and drummers are no exception. The Hero4 Silver/Music edition offers high quality 1080p video @60 fps, and also features amazing low light performance, perfect for that drum cam footage at live shows. This model also includes music mounts, meaning that you can easily snap it in place anywhere on the drum kit itself. What better way to show the world you’re a drummer than by wearing a t-shirt with a cool print? If you’re not really familiar with music gear but still want to get your drummer a gift that’s related to their instrument of choice, this 100% ring- spun cotton t-shirt with a minimalistic and artistic depiction of a drum kit is probably your safest bet. Being a drummer requires you to have a wide selection of tools at all times. This multi-tool has just about everything a drummer may need when it comes to dealing with differently sized bolts and nuts. The best thing about it is the fact that it’s so lightweight and compact. Your drummer friend is guaranteed to be thankful for it! Whether it’s for listening to a metronome or the rest of the band, in-ear monitors are a must have for anyone who considers themselves a serious drummer. The MEE audio noise isolating monitors offer solid noise isolation for added sound clarity as well as crystal clear sound. The cables are detachable, making them not only great for carrying around, but it also means that they won’t snap that easily. For just under $50, these in-ear monitors are an inexpensive, yet very practical gift for a drummer. There are two types of drummers out there: the ones who hold extra drumsticks in the back of their pants, and the ones who use holders on their kit. The DA100 stick holder is a very practical and efficient way of having multiple pairs of drumsticks nearby at all times. It fits securely on most standard drum hardware, and the angled arm allows you to position it in a way that’s comfortable to reach but doesn’t put the holder in the way. A solid drum throne is an essential part of a drummer’s rig. If you really want to surprise a drummer, get him the Gibraltar 6608 heavy drum throne, they’ll love it. The height of it can be easily adjusted, and once the optimal height is achieved, simply lock it and you’re good to go. The motorcycle style seat is not only sleek looking but allows the drummer to move their legs freely while still being very comfortable. Wait, isn’t this an article about the best gifts for drummers? Sure, the Zildjian cutting board may be a novelty gift, but we had to include it. The board is made from 100% real bamboo and is very lightweight yet resilient to cuts. The Zildjian logo gives it extra points in terms of aesthetics. It’s a great gift for a drummer that’s also passionate about cooking. Making spring (drum) rolls on it is a real blast (beat). Novelty gifts and cheesy jokes aside, at number 14 we have a pack of drum mutes by Evans. Providing up to as much as 95% volume reduction, they turn a standard drum kit into a kit you can play anyplace, anytime. This is a great gift for a drummer that owns a drum kit but lives in an apartment, or just can’t practice at home because of similar reasons. This pack includes 12, 13, 14 and 16-inch pads, so the whole kit is covered. Sometimes a regular old practice pad is enough to make a drummer happy. The 2- sided practice pad by Evans features a rubberized surface on one side and a neoprene surface on the other. This means that you can switch from a realistic stick rebound to a one intended for a real workout when practicing various stroke patterns. It easily fits inside a snare basket for extra convenience. A Cajon is a simplified version of a drum kit, offering a unique approach to percussion instruments. It’s perfect for acoustic gigs and jams and has a beginner- friendly learning curve, especially amongst drummers. This model is made from birch wood and simply sounds amazing. It also features an adjustable playing surface, so you can easily tune in the amount of slap you get out of it. For just over $50, the Meinl Percussion Cajon is a gift that your special drummer friend probably won’t expect but will be pleasantly surprised by. Sure, you could always get a couple of fresh pairs of drumsticks for that special drummer of yours, but how about personalized, laser engraved ones? The actual text is fully customizable, with a variety of different fonts to choose from. You can order these sticks with pretty much anything engraved on them, as long as it fits. Mark a special date, the drummer’s name, or your new band logo on the sticks. It’s all up to you to make this gift personalized and unique. Make your drummer friend feel like Bear Grylls with this drummer survival kit. It has pretty much everything a drummer might need. Drumhead repair patches, snare strings, felts, sleeves, and washers. Having this kit in your pocket means you’re ready for just about any situation you might find yourself in. With a price tag of around $10, this is a great budget-friendly gift that is bound to save a lot of nerves, time, and money! Slippery drumsticks get really annoying really fast. That’s why these rubber grips are a great and easy way of having a good grip at all times. As they are reusable, you can enjoy the convenience of a good, tight grip for a long time. The fact that they allow you to align the wood grain with your grip also means that your sticks will last much longer as well. If your drummer friend tends to drop their sticks but doesn’t like wearing gloves, this may just be the perfect gift! If the drumsticks grips aren’t enough, you can always go for a pair of gloves! These don’t just look sleek but offer optimal grip as well as comfort. The palms are made from lambskin, and the back is vented, in order to avoid excessive sweating. The velcro closure makes them even more practical and easy to put on and take off. You just need to make sure you’re getting the right size! Well, that was our pick of the top 20 best gifts for drummers! We hope that you found this article useful and that it helped you with picking just the right gift. As always, thank you for reading, and we’ll see you in the next one!